1. Lately I have been loving bright fun colors on Evan. I love shorts that have an elastic waistband, because my little boy loves to move around like a crazy monkey. These beautiful knit-waist trouser shorts are from Gap. I am so excited to purchase these for summer. 2. A fedora hat can make any outfit pop. It gives your baby a little edge and style. 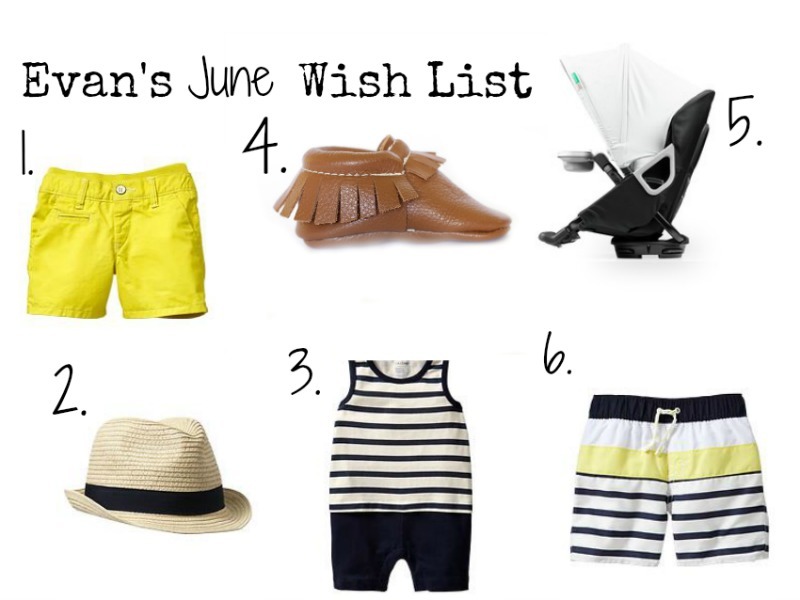 Every baby should own a fedora this summer. Go out to the pool or beach and that hat will come in handy. This cute straw fedora is from Gap. 3. I love dressing Evan in a one-piece it makes diapering so much easier. I love that this is sleeveless and 100% cotton. This adorable striped tank one-piece is from Gap. 4. I am obsessed with freshly picked moccasins. I just discovered these. I want Evan to own every color. Does your baby own a pair? If so, how do you like them? 5. Now that Evan is sitting up, when we stroll him around in his orbit baby car seat he throws a fit because he wants to sit up not lay back. My boyfriend and I have decided that it's time for us to purchase the stroller seat. 6. Summer is here! Let's go swimming. Evan needs swimwear and these trunks are simple but cute!! Guess where they are from? Gap! I'm loving their new arrivals. Can you tell? What's on you wish list? Thanks for stopping by!